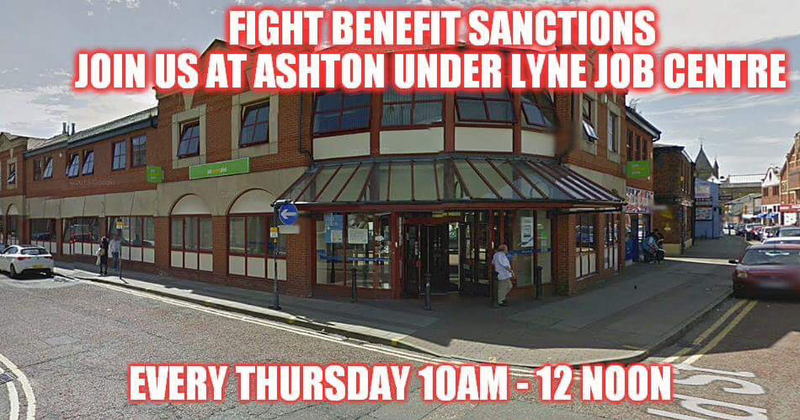 I honestly didn’t think that we would still be stood outside Ashton Under Lyne Jobcentre over two years after making the decision to be a solid presence there. I can’t stress too much how heart breaking it can be at times. I don’t think that anyone could perceive the horrors that still continue happening inside that building. I do feel that its reputation of being one of the worst Jobcentres in the country is very well earned. As you may know we now hand out food parcels that are donated to us from a lovely lady nearby who helps the homeless in my area, and we also get food parcels donated from friends, members of the public and even MPs on occasion. That was a lovely surprise. These food parcels have become essential because we now have claimants that depend on them every week to keep going. For example the man that is still sanctioned who is being forced to use the Jobcentres computers everyday because he doesn’t have computer access. He really struggles with this and I can see that it is draining him. His advisor has refused to let him do a paper job search as well and we have advised him of his rights. His English is poor and I suspect that his advisor has taken advantage of this fact. 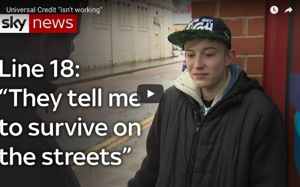 He says that the food parcels keep him going, otherwise he would most likely eat nothing. We have a lady that comes to see us every week. Her situation is complicated and she is going through an appeal process. When we first saw her she was in tears, and to be honest she didn’t look well at all. She is also disabled and uses a walking frame on wheels with a seat on it. We made her feel welcome, told her that we care for her and that we could give her some food. She started crying because she couldn’t believe that someone cared and didn’t want to ask her lots of questions. A hug and some food cheered her up. One of our members gave her some money, not a lot because we don’t have money either, but the look on her face said it all. She hadn’t had any money in her pocket for such a long time she didn’t know what to do. It was a look that I’ll never forget. She didn’t say hello last week, but she had been in hospital. It had all got too much for her, but the thought of being able to see us again kept her going. She was back this week and I was very glad to see her. We gave her a food parcel and a chat. I find it disgusting that people are so poor now that they forget what it is like to feel money in their hands, going into a shop and spending money is a revelation to them. Its appalling. I’m certain that the Tory government really do believe that the poor don’t deserve anything. I got chatting to a man who had been denied his ESA after his medical. The Jobcentre refuse to let him sign on whilst he waits for his appeal because he is too sick. I signposted him to our local citizens advice centre who will then send him to welfare rights. Its how it works here. But I have promised him that I will help him if he doesn’t feel comfortable with the help that he might get. His needs are complex, and trust is a major issue with a lot of claimants because they are that worn out with the whole system and feel so degraded and humiliated that they trust no one. Can you imagine feeling like that? Its awful and I have been there myself so I know how it feels. I gave him a food parcel along with some kind words and he was happy that he would eat that week. I stopped a young man who had been in the Jobcentre who I could see needed help. After two years outside that building I have developed a good sense of intuition for people who need help. I asked him no questions except to ask him if he would like a food parcel. He said that he’s been sanctioned for a month now and he has resorted to shoplifting for food. I won’t judge him for that because I totally understand why he’s doing that . He’s simply trying to stay alive. Exisiting I call it because he has no life. I managed to persuade him to have a few days off and to have a rest. He was really glad of it. One less day of worrying about how he would eat. I also was stopped by an older lady that I had helped not long ago. I wrote about her in a previous blog. She had nothing and is a victim of the women’s state pension increase. She grabbed hold of me and gave me a hug. She told me that the kindness that we had shown her and the food that I had bought had quite literally saved her life. She said that she couldn’t thank us enough because she was at her lowest and didn’t know where to turn. I was overjoyed at seeing her. She had taken on all the advice that I had given her and no longer felt alone. She said that she was so proud of us all for being in the local newspaper and that she tells everyone about us. I must admit I did leak a tear. I love this lady she is amazing as are all the claimants that we meet. To survive this evil regime is a great achievement. To summarise this is only a few of the conversations that I and the crew had with claimants on Thursday morning. I do feel that we have gone further back in time poverty wise than the 1930’s. This is more like Victorian poverty. People not being able to remember what money felt like in their hands, hunger like I’ve never known before and desperation at its highest levels. What right does a Tory government have to inflict this abject cruelty upon the poorest and most vulnerable in society? They don’t have a right at all but they think that they are given that right by the people voting for them. Its the Tory party that are creating this relentless war against the poor, and its the rich Tory party members and supporters who are financially gaining from this. My heroes are the victims of this governments heinous war against the poor,disabled working and non working poor. I love and respect you all. For you are all amazing. Many thanks to everyone who donated their time to come and speak to us, and many thanks to everyone who donated a food parcel. This week within two hours we gave away seven. Rumour has it that the Jobcentre aren’t very happy with our handing out of food parcels but we shall continue. Please donate if you can. It doesn’t just end after a couple of hours outside the Jobcentre and we are always in need of leaflets etc. Thank you! Universal Credit promotion continuing and DWP involvement with The Poverty Agenda Group Oldham And Tameside. Hi charlotte! I’d like to make a donation for your food parcels. .only small I’m afraid as I’m a working single mum. .I’m not being rude but are you sure your link is safeeling and hack proof? I ask because I’ve been a victim of card cloning? ? Hi Charlotte, We are very moved by your blog – I grew up around Newcastle Under Lyme – many many decades ago – I also spent much of my working career with people in need of help – but we are now retired and very blessed with comfortable circumstances – I am honoured to share membership of the human race with you (the only one that is important!) and will be donating to your paypal in order to contribute to enabling you to do what you do! i have read many times of the work you are doing. but this time i am in tears at what is happening to people in this country in this so called modern day times. i wish i was nearer. i have food a plenty if not much money.but i live in yorkshire. however i can and will send something. you really have moved me. just sent a donation via paypal .then it said it was returning me to your website but sent me to one that was no ones., was one where you purchase a domain name etc, http://ww2.yourwebsite.com/successful.html.is this right? Same thing happened to me, made a donation and got redirected to a website purchasing site ? thanks ill be fine. this whole austerity thing gets to me at times. as it must to a lot of others. not sent much im afraid but itll help towards your leaflets or buy a few tins ,bread etc. for someone. was it right sending me to that website i quoted above? The legal term for their game is genocide.